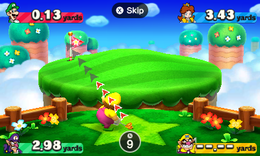 Chip Shot Challenge is a 4-player minigame found in Mario Party 3. It reappears in Mario Party: The Top 100. The players have to make a shot as accurately as possible within the time limit. If a player gets a hole in one, that player automatically wins. If this happens, Lakitu holds a sign saying "NICE!". Other players can make a hole in one and win too. If no players make a hole in one, the player whose ball is closest to the hole wins. If two or more players tie with the condition of no players making a hole in one, all of those players will still win. In Battle Royale mode in Mario Party 3, the players take turns according to the turn order during the board. In Mini-Game mode, the players take turns according to player order. The player who goes first is chosen randomly, with the remaining players taking turns according to player order. There is no rough on the side. The flag faces the opposite direction and is animated. The stands are replaced with fences and flowers. All players' distances are visible throughout the mini-game. 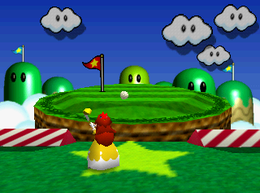 The golf clubs are no longer colored according to the character, instead using the standard player colors. Instead of increasing or decreasing in height, the aiming meter fills up. Characters vocalize when they hit the ball. After the ball lands, a trail appears between it and the hole. There are no longer markers showing where each player's ball has landed. Computer players' turns can be skipped with . Computer players' aiming meters disappear after 3 seconds, possibly to prevent players from copying them. The hole-in-one animation is different: fireworks are set off and the words "Hole in One" (translated into other languages) appear. Game Rules – "Aim for the hole, then hit the ball. The player closest to the hole, wins." Advice – "Look closely at the slope to plan your shot. Any player who hits the ball into the hole, wins coins." Description – "Hit the ball into the hole on the green!" On-screen – "Hit the ball into the hole!" Nia pin pittari! Near-Pin Perfect! Donkey Kong swings the club one-handed, much like in Mario Golf. This page was last edited on April 5, 2018, at 22:41.